Thank You to Booking.com! The Guest Review Awards from Booking.com have been announced and we score high!! We’re so happy our guests have awarded us a whopping 9 out of 10 for our hotel! A huge thanks to all those who took the time to review and comment! Home » Blog » Thank You to Booking.com! The Guest Review Awards program is Booking.com’s annual appreciation program that recognizes partners for their top-notch hospitality according to review scores left by guests after their stay. 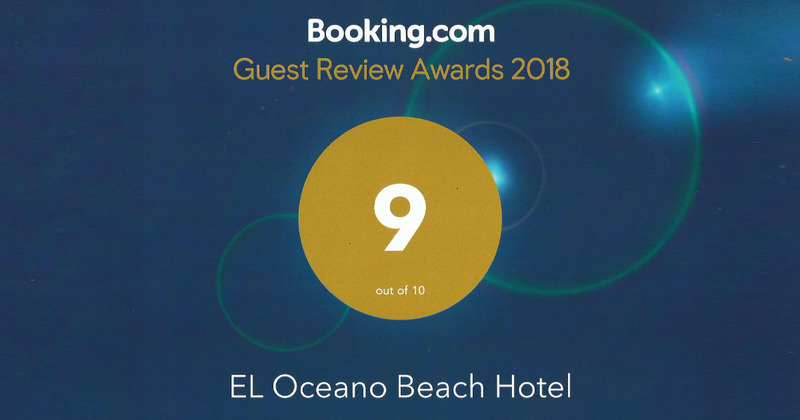 In January 2019, the 2018 Guest Review Awards were launched – the 7th edition of the awards – and we’re so happy to say we scored 9/10!! We just wanted to thank all those kind guests who took the time to write such kind comments and to thank booking.com for their continued support! Remember though… you can always book your luxury beach holiday at El Oceano directly with us!! Always the best option! book direct - best prices! Perfect for a 6-night stay! Want a great night’s sleep? This hotel was highly rated for its very comfy beds. Find El Oceano right on the water-front between Marbella and La Cala de Mijas, on Spain’s beautiful Costa del Sol. Getting here is easy, we are just a 30 minutes drive from Málaga Airport. El Oceano Beach Hotel, Restaurant & Beauty Salon between Marbella and La Cala de Mijas: Thank You to Booking.com!